I expected to see monasteries when I visited Armenia, but I didn’t think that I’d be visiting a perfect-looking Greek temple. Luckily, the only Greek temple in the whole of the former Soviet Union is only twenty miles from Armenia’s capital, Yerevan. If you want to leaven your daily dose of medieval monasteries with a dash of antiquity then a visit is recommended. Garni is a peripteros temple, the entablature supported by twenty-four Ionic columns. Unusually it is made of basalt, and is located on a hard to access cliff top surrounded by deep gorges. It dates to either 1BC or 175AD, depending on whether you see it as a temple to Mithra, or a Romanized mausoleum. Either way, though it was sacked in 1386 it stood intact until 1679, when it was destroyed in a devastating earthquake. (The longer you spend in Armenia, the more you will hear the phrase devastating earthquake. Unfortunately they’ve had a few). It lay in ruins until 1970, when it underwent a lengthy restoration. This has involved rebuilding the entire structure, using modern masonry where any blocks were missing. From a distance you think, that’s amazing, a complete Greek temple, roof and all. When you get nearer you realise that much of the restoration is new masonry. Nevertheless Garni is an impressive sight that brings to life the scale of Greek architecture. That the building survived at all is unusual, as the early Christians saw pagan temples as fair game as a source of building materials. 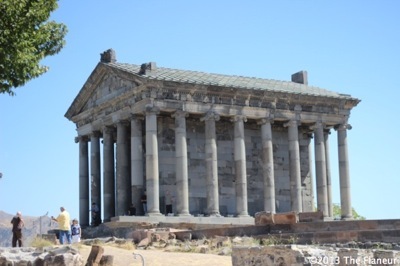 We have Armenian royalty to thank, as the Garni temple was so big and well located that the Armenian kings used it as a summer residence.They installed a bath house and a Christian church. 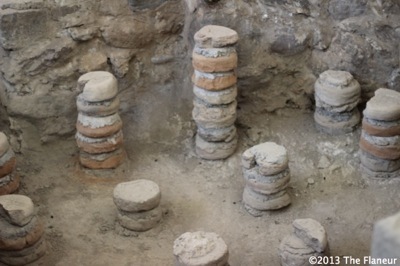 The foundations of the church can still be seen, along with those of the baths which show how the floors were supported so that the heat of a subterraneum fire could warm them. The different rooms had different level floors, so that when the fire was lit the room furthest from the fire remained coolest. It was hi-tech and a cool time to live – although you had to be king to make the most of it. A mosaic nearby reads ‘Laboured well, but got nothing,’ reminding that the slaves who did the building weren’t treated quite as well. Rather than being Do Not Touch, visitors are able to walk up the steep steps, enter the temple and walk around amongst the columns. This is remarkable access that also gives views over the Khosrov State Reserve across the gorge. Khosrov State Reserve has been a protected area since 330AD. When compared with the fact that the first National Park in the UK was designated in 1951 you begin to get an idea of the sheer length of history that is there to be discovered in Armenia. Greek?? This is Armenian Mithraic Temple dedicated to Mihr (Mithra). And architecture is similar to Ardini, prototype of Greko-Roman architecture.